...and applied them to everything. In 2013 Toby Vann and Michael Gates accepted a challenge to build a better mouse trap. Long time participants of the Burning Man festival, they wanted to eliminate many of the hassles associated with traditional methods of dome construction. During the winter of 2013, they developed the Hub & Harness Network. Borrowing from Buckminster Fuller, they used elements of geodesic and tensegrity principles to create their unique, truncated icosahedral domes. 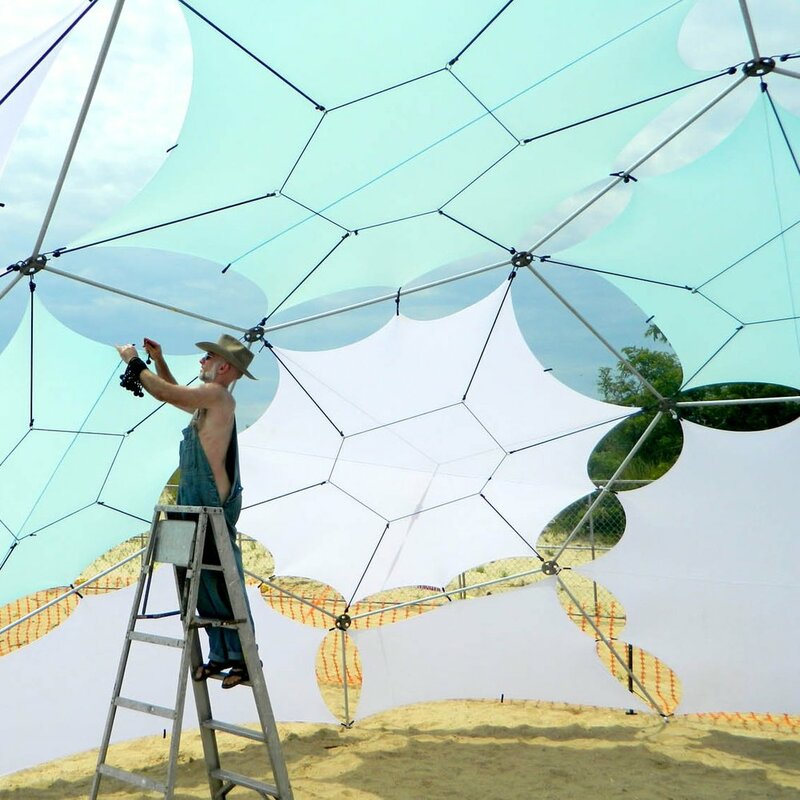 In August 2013, they premiered the prototype dome, named the Archimedes Basket, at Burning Man to test their theories. This crowd-funded project was wildly successful, and paved the way for Archimedes Design, portable dome systems. Toby Vann is an advertising and marketing executive. On October 1st of 2012 he decided take leave of that world to work on something of his own design. As a long-time theme camp organizer at Burning Man, he was drawn to shelters and portable construction. A designer and a maker at heart, he began to solve the problem he saw in existing products, rather than look to others to find a solution. With partner, Michael Gates, they researched and prototyped what has now become the QuickDome system. With the the system they have found loyal support of early customers, clients and festivals across the US and Canada. In January of 2018, they decided to market the system to the greater public, focusing on major sports, experiential marketing and corporate hospitality. Michael Gates is grateful for his liberal arts education. His contributions to Archimedes Design draw on an eclectic array of skills and talents, most of which he never imagined synthesizing into entrepreneurial solutions when he was gathering them up in his youth. A widely-ranging field of studies in algebra, geometry, poetry writing, literature, studio arts, religion, economics, and computer programming have all been applied in the service of bringing something new into the world. Prior to Archimedes, Michael worked for 12 years in publishing at John Wiley & Sons. Half way through this career, he transitioned from the business management of a subscription-based book program into software implementations, where he managed a global team during the roll-out of an online editorial tracking system in support of peer-review scientific journals. He brings a rigorous precision to operational systems analysis and team communications. Jodi Sharp is an artist and festival producer from Montreal QE. She holds an MFA in art and textile design from Concordia University. She joined the project as an intern in 2014 and immediately saw the value of the system that was being developed. Since then, she has provided valuable input and creative direction, earning herself a founder's position. Jodi has generated product and brand exposure through direct market experiences at festivals across the US and Canada. Her natural marketing instincts brought us a devoted niche market in a very short period of time. She relentlessly continues that push as we move into bigger worldwide markets. Sergio is seasoned Sales & Marketing executive, specializing in Film, TV & Sports across traditional and emerging media platforms, Sergio brings vast experience in sales and sales management, business development, Joint-Ventures, partnerships, equity/capital raise, and international business & expansion. Getzel previously spent 25 years with NBC Universal, most recently as Sr. VP International Sales, Business Development & head of NBC International, working with a worldwide sales team focused on content distribution and strategies, developing strategic, business development and M&A opportunities for NBC and General Electric. He is credited with negotiating long-term alliances and content distribution arrangements in Korea, Japan, Italy, Spain, Germany with various telecommunications brands and spearheading the launch of CNBC day-parts in Asia. Jay Frank Castle, Esq., has been advising Archimedes Design since shortly after their first crowdfunding campaign, in support of the first full-sized prototype. He has mentored the company through the early years of product development and has been a hands-on driver in moving to major sports and event markets. Jay is an experienced corporate legal counsel and a Florida Supreme Court certified mediator. Jay serves on the boards of several private and nonprofit companies. Jay also serves as a mentor in the Capstone Entrepreneurship Training Program at the University of Pennsylvania's Graduate School of Education. Jay received a Bachelor of Arts degree (with High Honors) from the University of Florida and a Juris Doctor degree (with Distinction) from Emory University School of Law. We're always innovating. Subscribe to our newsletter and receive periodic updates.